You have probably noticed that MrSikhNet.com once again looks totally different. The last design was only temporary till I worked out a more final design. With the new design you can get a highlight of all the recent articles and a few particular ones that I feature. On the very top there will be the latest "featured" articles which you can browse through. In the lower right corner you’ll notice numbers "1" 2" which you can click on to scroll through. You’ll also see the latest comments, random blog posts from the past and other related happenings home page. The top navigation also includes a navigation bar organizing some of the blog posts into popular categories. So you can browse through previous blog posts according to the category. I was feeling like the sidebar was getting so long with way too much stuff, and there wasn’t enough room for blog posts. I’m still tweaking things and making improvements so we’ll see how things end up. I hope you all like the new design. Looks nice. It’s much improved from the transitional one. The dirt and flowers design always made me feel like I was staring up from the bottom of a pit…lol. By the way, congratulations on the recognition from SALDEF youth leadership award. Absolutely stunning! Very well done. A good, clean look. I think you’re a bit like me, just can’t stop fiddling with our blogs/websites. Well, why not? We all have a bit of frustrated artist in us, I think. And, yes, congratulations on the SALDEF Award. It is richly deserved. what i miss in this design is the visual impact – it has become much too simplistic and uninviting. it lacks the sikh touch in terms of visual appeal. you blog content has indeed grown in leaps and bounds but the right design sytle is still elusive. i speak this from the perspective of a graphic and web designer and so will refrain from misleading you on my honest opinion. please reconsider this design, it has not caught my favour. great new design, i like it very much it is like a magazine theme, just curious you still using K2??? I like that it is organized. It is a neat design but it doesn’t go along with the blog’s purpose. Needs some Sikh flavour! Lakhvir Singh, would be great to have a more Sikh like design. At this point I don’t have a huge amount of time so….did my best to find an existing wordpress theme that I could use as a base. I had a lot of criteria that I needed to fulfill…and wasn’t able to find a theme that worked for everything. 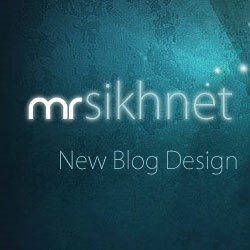 If this were the SikhNet website I would devote more time to the design… as it is I already spent like 3 days working out the theme stuff and customizing things. I really wanted to have some of the more visual Sikh aspects in the theme, like how I had earlier with the headers, but most of the themes with headers were not wide enough and didn’t have options for multiple headers. Anyways…. it’s the content that counts most…so as long as people can access and get to what they want to read then that’s most important.